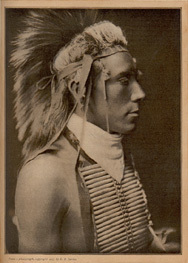 The Northwest Plains Indian is, to the average person, the typical American Indian, the Indian of our school-day books--powerful of physique, statuesque, gorgeous in dress, with the bravery of the firm believer in predestination. The constant, fearless hunting and slaughtering of the buffalo trained him to the greatest physical endurance, and gave an inbred desire for bloodshed. Thousands of peace-loving, agricultural-living Indians might climb down from their cliff-perched homes, till their miniature farms, attend their flocks, and at night-time climb back up the winding stairs to their home in the clouds, and attract no attention. But if a fierce band of Sioux rushed down on a hapless emigrant train the world soon learned of it. The culture of all primitive peoples is necessarily determined by their environment. This, of course, means that all plains tribes--though speaking a score of languages--were, in life and manner, broadly alike. They were buffalo-hunting Indians, and only in rare cases did they give any attention to agriculture. Buffalo meat was their food, and the by-products their clothing, tools, and implements. The plains tribes in earlier times were certainly true nomads. For a time, in the depths of winter, they camped in the shelter of some forest along the streams. Other than that, wherever roamed a herd of buffalo, there also wandered the bands of Northern Indians. The very existence of these tribes seemed bound to that of the buffalo. From the skins their lodges were built. With the hair on, the hides furnished the robes for the body, as well as mattresses and bed coverings. The meat, prepared in many ways, with the addition of a few roots and berries, furnished their entire food. Advancing civilization has swept these countless herds from the face of the plains, and left their human companions stranded. In many despondent hours of pondering over the fate of these native children I have felt that perhaps if they, too, could have perished with the buffalo herd it would have been vastly better for them. But, no! Though thousands of years behind us in civilization, they are human beings. Their loves are like our loves; their affection for their children like our own, except that many ages of civilization have given us, perhaps, a little more self-control. In a cabin on the plains of Montana three of us sat talking: an educated plains Indian, a Government sub-agent, and myself. I was telling of the splendid advancement of the Apaches, and how well they would work. At the close of my story the agent turned to the Indian and asked him, "Why don't your people work like that?" All about the cabin, as a decorative frieze, was a row of buffalo skulls. The Indian looked up at those skulls, saying: "They tell you why. While those buffaloes were alive we did not need to work. Only niggers and white people farmed. We were a superior people and had nothing but contempt for those who worked. Do you realize that I, a comparatively young man, know the days when if we wanted food we had but to ride out on the plains, shoot buffalo, or other game, and the women would go out and bring it into camp? Do you expect us, in the fraction of a life-time, in the quarter of the age of an old man, to have changed our whole life, and even to have forgotten the days of the old freedom, when we were lords of all the great plains and mountains? In what way does your civilization benefit us? Before you had attempted to force your so-called civilization upon us we had every desire of the heart! An easy, simple, carefree life, and to the worthy and brave a certainty of a future life of plenty and comfort. What has your civilization done for us? Robbed us of our land, our strength, our dignity, our content. Even your religion has robbed us of our confidence in the hereafter. What have you given us in return? Desire, corruption, beggary, discontent. You have robbed us of our birthright, and scarcely given us a husk. You said we did not make use of the land as the white man would, so you took it from us and use it as you like. I could as well go to the man who has his millions loaned at three per cent. and say, `You are only getting three per cent. for this. I can use it and make ten. I will take it because I will make the best use of it." It is true that advancement demands the extermination of these wild, care-free, picturesque Indians, and, in the language of our President, we cannot keep them or their lands for bric-a-brac. 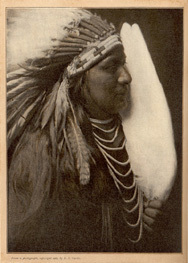 The fact that we cannot, however, makes it nonetheless regrettable or hard on the people who are being ground beneath the wheel of civilization, and though we may be able to justify our claims that advancement and progress demand the extermination of the Indians, we can scarcely justify the method used in this extermination. As the years pass on and we are able to see this subject as history, stripped of its little local prejudices, we will be found guilty, as a nation, under the manipulations of crafty, unscrupulous politicians, of having committed more than "the crime of a century." In all our years of handling the Indians we have taught them one thing--the white man seldom told the truth. The relationship of the Indians and people of this country is that of a child and parent. We will stand convicted for all time as a parent who failed in his duty. For once we have a commissioner whose hands are free. 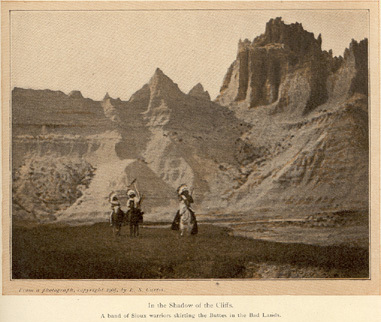 No senator or congressman may say, "You cannot," or "You must not"; and to appeal to the Chief Executive is to be told, "As far as the law permits, Commissioner Leupp controls the Indian Department, and I can give you no assistance." The present sane, straightforward handling of the subject is productive of great good, and it is to be hoped that many years of work can be carried on without a change of policy, as the continual changes of the department's so-called policies have been one of the Indians' greatest curses. In June of last year I went into the hills of the Okanogan country in eastern Washington. The occasion of my going was the reburial of the splendid old Nez Perce chief, Joseph, and the erection of a man-fashioned monument at what it is hoped will be his final resting-place. Matters dragged in the digging of one grave and the digging out of another. It was no small task, and, hoping to expedite matters, I dug, pried, tugged, and lifted in assisting to get that burial-chest out of one place and moved to another. It was what one might term a study in practical or applied ethnology. Many speeches were made. A college professor in frock coat and silk hat did part of the talking. Several chiefs and would-be chiefs in blankets and feathers did the rest. We did not have the regular Indian burial rite in the reburial. The Indians said: "Last year we buried him; this time just move him." A child died early that morning, and the Indians buried it in their own way late in the afternoon. In this there was no "Boston hat" or " Boston man's talk," but a most beautiful pagan ceremony. The mourners encircled the grave. A high-keyed, falsetto chant by forty voices, rising and falling in absolute unison, sent chills down our spines that hot June day, as does the dismal wail of wintry winds in the pine forests. On the following day came the Chief Joseph potlatch--a Hi-u potlatch (Big Giving), in which every earthly possession of the old chief and his wife was given away. Through it all the wife sat by the side of the great stack of goods being distributed, handing out each article and trinket. At times when some article obviously dear to her heart was handed out great tears would roll down her cheeks. Two days were taken in this giving, and then the visiting Indians tore down the grand council lodge, and so closed the last chapter in the life and death of the most decent Indian the Northwest has ever known. No more will he beg of the Great White Father, and say: "All I ask is to go back to the old home in the Wallowa Valley; my father's home, and the home of my father's father." His troubled life has run its course, and one of the greatest Indians who ever lived is no longer a part of the white man's burden. 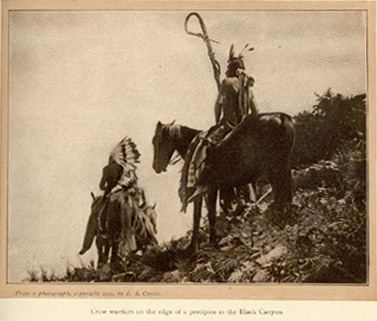 The Crows, of Montana, who call themselves "Absarokas," are one of the strong groups of the Northwest Indians. They did not take to fighting with the white settlers or soldiers, but from the earliest traditions have been constantly engaged in intertribal war with the Sioux, Piegans, and other tribes. At no time were they allied with the other tribes of the region, and, being fewer in number, their very existence was a fight for life. This fact kept them up to the height of physical condition. None but the strongest could survive. To this they perhaps owe the fact that of all of the Northwest tribes they are the finest in physique. They have a splendid reservation. It is allotted, and, so far as it is possible for Indians to get on in the battle to be self-supporting, they are doing well. But the remodelling of their life to meet the changed conditions forced on them by advancing civilization is solving the Indian problem for them, and at the present rate of decrease there will not be a living Crow in forty years. 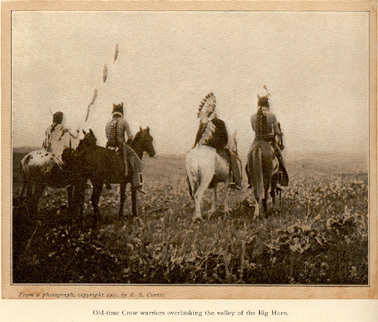 The Custer battle-field is close to the Crow Agency. 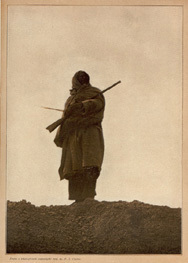 In a desire to know all that I could, at close range, of the tragedy of the Little Big Horn, I spent many days in going over the battlefield foot by foot, from where the troops left the Rosebud to the ridge where the men had made their last stubborn fight. White marble slabs mark the spots where they fell. In most cases the slabs are in twos, side by side. Strange how it is when it comes to the final end, we reach out for human companionship. There they made their last earthly stand, bunkie by bunkie. Among the dozens of Indians I questioned of the fight was Curley, who is so often called the sole survivor of the Custer fight. 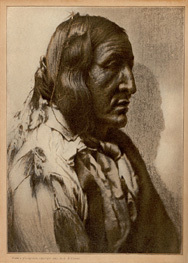 He has been so bullied, badgered, questioned, cross-questioned, leading-questioned, and called, by mouth and in type, a coward and a liar by an endless horde of the curious and knowledge seeking, that I doubt to-day, if his life depended upon it, he could tell whether he was ever at or near the Custer fight. I was particularly interested in getting the Indian point of view as to the bravery and respective fighting qualities of the different tribes. The Crows, in summing up the other tribes, claim that the Flatheads were the most worthy foes in intertribal fights, "as they fought most like us." On the other hand, they claimed that the Blackfoot was brave to recklessness, but was foolhardy and lacking in judgment; did not even know when to run. The Sioux were a worthy foe, and so greatly outnumbered the Crows that the latter could succeed in their fighting with them only by quick, bold strokes, and then back into their own country. 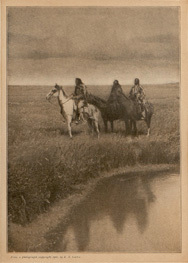 Many a Crow war party went out to the land of the Sioux never to return. One expects to find the highest development of the Plains Indians in the Sioux, but I question the fact. Physically they are not equal to many of the other tribes of that region. In legend and mythology the field is more sterile than with the small, isolated branches of the Algonquin stock, the Blackfoot and Cheyenne. But it is among the Sioux that we find the greatest number of old historical characters. Each year cuts down their number, and soon these old fellows who know of the days before the coming of the white man will be no more. 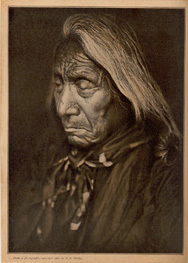 Red Cloud is, without doubt, the record holder of the living North American chiefs to-day. His home is close to Pine Ridge Agency. Ninety-one years old, blind, almost deaf, he sits dreaming of the past. No wonder he is irritated by the idle information seeker! Who would be called back from the dreams of his youth? Sightless and infirm, he is living over the days when in youth he sat his horse as a king, the pride of the great Sioux nation. To his ears must come the roar of the hunt as the countless bison herd, like a tidal wave, rolled by; and, again, the great day of his life, when his red-blanketed band swept down on the hapless Fetterman troop. Even now his heart must seem to stand still as he lives over again that day. And then that fearful day of the " Wagon Box" fight, when he hurled the pick of the Sioux nation against those thirty-two riflemen concealed in that corral, only to have his men mowed down by the repeating-rifles, with which this was the Indians' first meeting. Intertribal Indian wars were, like most warfare up to a rather late date, war for plunder. Prehistorically there was little in the Indian life worth stealing, except the women. Later, after the Spanish invasion, there were the horses as well, which made marauding warfare far more worth while. The discouraging part of this sort of war was, that quite often the war party would fail to return to their homes, and in the camp of the enemy there would be a most merry scalp dance, with fresh scalp-locks on the coup sticks. In working with the Crows I gathered together a party of the men and made a long trip across the reservation and into the mountains. My bunch of Indians were certainly a picturesque and interesting group. Two of the best characters were old Bull Chief, eighty-five years old, but still good for a forty-mile day in the saddle, and old Shot-in-the-Hand, quite a few years younger, but old enough to know a great deal of the old life. Our tents were the Indian lodges, and at night-time, around the lodge fire, the old fellows told me stories of the old Indian life. Bull Chief was the best Indian story-teller I have ever known. With clear, keen memory he traced back the Crow history through the lives of ten reigning chiefs. He was old enough to kill Buffalo calves with bow and arrow when he saw the first white man, and his people were still using stone axes. His picture of the first time he saw a white man and the things of white man's make was most vivid. 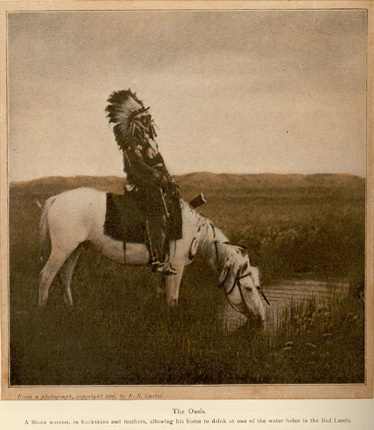 A trader, whom the Indians called "Crane," from his slender build and great height, came up the Yellowstone in a canoe, stopping at the junction of that stream and the Big Horn. Think of it! Seventy years ago these people, pure pagans, saw the first white man, and to-day we quarrel with them because they are not equally civilized with us, with all our thousands of years of education. Our camp was by a particularly beautiful mountain stream, in a deep, narrow canyon. One night the whole band of Indians was gathered by the lodge fire to listen to stories by old Bull Chief. 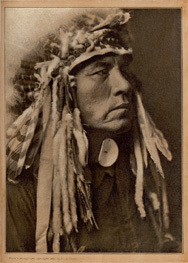 Story after story had been told by him of the terrific fights with Piegan and Sioux. Many of the men had dropped off to sleep, when on the quiet air rang out two signal shots. Every Indian was awake and out of the lodge in an instant. Their conversation was low; all was nervous excitement. "Who was it? What could it mean?" You would have thought we were a war party in the land of the enemy. I had them fire shots in reply to the signal, thinking it might be someone in distress, but could get no reply. My attempt to allay their anxiety and get them to telling stories again was useless. No more stories that night. But the old life, with its picturesque and romantic setting, like the war-ship with its white wings of canvas, has gone--passed on forever. The reservations have been cut down piece by piece. Now the Indian is accepting the inevitable and taking his allotment of a few acres. Across valleys and around hills they are stretching fences of wire. Along the edges of the valley, where a few years ago they hunted the buffalo, they are now digging irrigation ditches. On some of the reservations one sees marked evidence of advancement of the tribe, in so far as to become self-supporting as farmers. Among other tribes, through lack of proper management, or a resistance on their own part, no marked advancement has been made. A span of years between the extermination of the buffalo herd and the present has seen such management of many groups of Indians, however, as to demoralize and make beggars of them. The longer they are fed by the Government, without any effort on their part, the more worthless they become. A visit to the average Indian reservation means to go away discouraged. You find a lack of sympathy for the Indians by those who are responsible for their management. They say the Indian is lazy, irresponsible, dishonest; that the returned students are more worthless than the uneducated, and vastly more troublesome. Talk with the Indian, and he will tell you a story hat is most startling. At the best, it is an accusation that the management of the reservation affairs is dishonest and corrupt; that the principal effort the employees are making is to keep their positions; that the returned students are given no opportunity to advance, but, on the contrary, are kept down, and that the Government at Washington is not keeping the promises of the past, nor those of to-day. The outsider must read between the two extreme statements. He can see but little difference between the uneducated and the returned Carlisle boy, except that the latter is, if anything, more crafty. Also, as soon as you make a study of one of the educated boys or men after their return to the reservation, you see that education is not civilization, and are convinced that while you can educate an Indian in one generation, you cannot civilize him in so brief a period. As soon as his school uniform is worn out you cannot pick him out from the other Indians. To escape the ridicule of his own people, and following along the lines of least resistance, he lives as his tribe lives. If, on returning home, he finds his family sleeping on the ground, eating food squatted around the kettle in which it is cooked, he also sleeps on the ground, and joins the circle about the kettle, reaching in his fingers or spoon. What else can he do? As a matter of fact, there is little else for him to do. As for the Indians' charge of mismanagement and incompetency, while there is much truth in their statements, it is certain that they overdraw their grievances. The department experiences great difficulty in getting capable men who have the moral strength and courage and the interest in the Indian to do the work. Generally speaking, if a man is capable of filling one of these places, he is worth more to himself than the Government pays. I can personally think of many agents who are doing all that any human being can do for the good of their people; even using money from their own salaries to help; and it is certain wherever you see an agent of that kind you see advancement. It may not be considered advancement by the people in the neighborhood of the reservation, but their point of view from self-interest is not broad enough to be considered. What they claim as knowledge is prejudice. In a recent conversation with an educated Indian, he wanted to know what I, after many years among the Indians, thought was the solution of the problem. 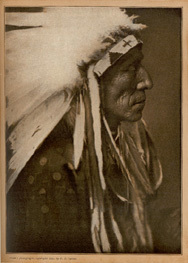 "Your tribe is, perhaps, in the best condition of any of the Northwest Plains tribes. You have better farming lands. Your people are showing more progress, more energy, and a greater desire to accumulate property and become educated. You are decreasing at the rate of three per cent. a year. Take this pencil and figure out your own solution." At the end of a few minutes he looked up, with a surprised, wondering expression. "Why, if I live to be an old man there will be none of my people left." "Yes, my boy, there will be a few of your people left. It will be a survival of a limited few of you who are best fitted to meet the changes which civilization is forcing upon you."